HISTORY has a very real chance of repeating in this year’s Supercheap Auto Bathurst 1000. 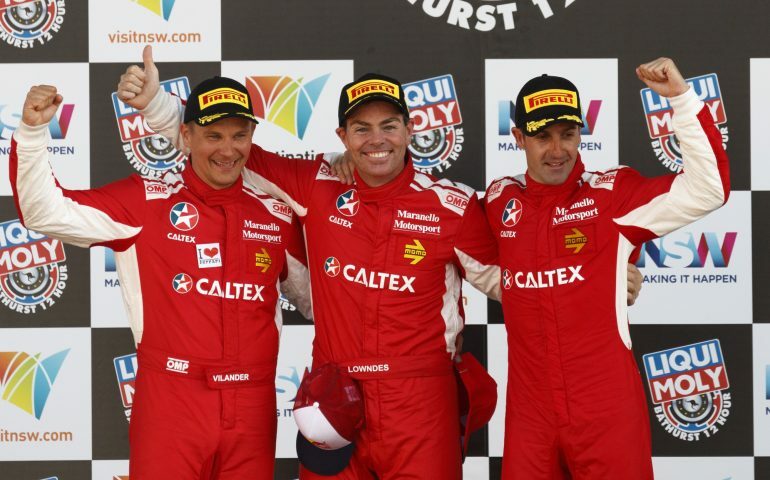 Though not driving together, both Craig Lowndes and Jamie Whincup are each considered strong chances of repeating their victory in the Liqui-Moly Bathurst 12 Hour in February this year should either driver win the annual October classic this weekend. Lowndes scored a second 12-hour win this February – adding to his six victories in the 1000km race – while Whincup’s win came on his GT racing debut. The pair were driving a Maranello Motorsport Ferrari 488GT3 with Finnish factory Ferrari ace, Toni Vilander. Lowndes will drive the Caltex Vortex Commodore with four-time Bathurst 1000 winner Steven Richards this weekend, while Whincup will race the sister Red Bull Holden Racing Team entry alongside Paul Dumbrell and both are considered chances for victory. Should either combination win on Sunday this weekend they will join an elite club – that currently has one member – of drivers to have won both races in the same year. Tekno Autosport’s dramatic victory in the 2016 Supercheap Auto Bathurst 1000 saw Jonathon Webb become the first driver and Tekno the first team to win the ‘Bathurst double’. Webb was just the seventh driver to have won both majors, however created his own piece of Bathurst history when co-driver Will Davison crossed the line fractions ahead of Shane van Gisbergen’s Red Bull Racing Holden. Earlier that year he had paired with Alvaro Parente and Shane van Gisbergen to score McLaren’s first 12-hour win, edging out the factory Nissan in a tense finish. Webb’s two Bathurst victories in 2016 were achieved by a combined total margin of 1.419 seconds. Only seven drivers have won both Bathurst enduros while just two have achieved the feat back-to-back – winning the October 1000km race first before following it up with a win in the 12-hour early the next year. After teaming with Win Percy to take an incredible win in the 1990 Bathurst 1000, Allan Grice went on to win the inaugural Bathurst 12 Hour race the following year when he shared a Toyota Supra with Nigel Arkell and Peter Fitzgerald. Meanwhile, fresh from his 1993 Great Race success with Larry Perkins, champion two-wheel racer Greg Hansford continued his run of victories on four wheels by winning the 1994 12-Hour on the Easter long weekend, sharing a Mazda RX-7 with Neil Crompton. John Bowe has two wins in both the Supercheap Auto Bathurst 1000 and Liqui-Moly Bathurst 12 Hour, while Craig Lowndes, Paul Morris and Tony Longhurst have also won both – with Webb joining that list last year. Morris is the only driver to achieve success in the 12-Hour before winning the October classic – having driven a BMW to victory in the 2007 and 2010 Bathurst 12 Hour races well before he paired with Chaz Mostert to win the 2014 Supercars epic on the Mountain. The Queenslander created another piece of Bathurst history this year when he teamed with Luke Searle to win the Bathurst 6 Hour Production Car enduro – the first to sweep the 6, 12 and 1000km races at Bathurst. Lowndes won for Ferrari in 2014 and again this year while Longhurst won for Mitsubishi in 2009, driving with Damien White and Rod Salmon. Nissan are the only brand to have ever won both races, thanks to their Bathurst 1000 double in 1991 and ’92 and their dramatic 12-hour victory scored in early February 2015. Tekno Autosport were the first full-time Supercars team to win the 12-hour thanks to their relationship with McLaren’s customer GT program, while Triple Eight provided race engineering support to the Maranello Motorsport Ferrari that won this year.